One of the smartest things you can ever do when marketing your business online is to ask the people who are already on your list what they want from you. This is the way to connect with them and to find out how you can best serve them with your knowledge and expertise of your niche topic. Hold a teleseminar and invite them to ask you anything. I have done this regularly since 2007 with great success. Once I know what my list wants from me, I prepare a course to teach them. 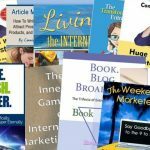 My most recent course teaches how to market for small businesses. My people told me they wanted to be able to make money by blogging and marketing for businesses in their city. I have been doing this since 2006, so I created a course so they could do it as well.